With the Super Bowl right around the corner, I feel like I should post something snacky. I’d probably be a bad food blogger if I didn’t, right? But I have to confess, I won’t be watching the Super Bowl this weekend. Football is the worst, you guys. The worst! There are some sports that I kind of understand. Like soccer. Kick the ball into the net. Easy! But with football, there’s just too much going on. There’s running and numbers on the field and a weird shaped ball. Confusing! When we had to play flag football in gym class, the teacher never even bothered to explain how to play because I guess, like breathing and sleeping, everyone just innately knows. So I’d just run in whichever direction seemed appropriate and when it looked like someone wanted to throw the ball to me, I’d shake my head, wave my arms, and mouth the word “NOOOOOOO!!! !” And if I did, for some reason, end up with the ball, usually I’d throw it to whomever was closest to me, whether they were on my team or not. Because I did not want the ball. And then everyone would yell at me. Oh, they would yell. That is what I know of football. Then there are the people who say, “Oh, I just watch the Super Bowl for the commercials!” And really, the only thing I can think of that’s worse than watching the Super Bowl is watching the Super Bowl and watching the commercials. Because really, the only commercials I will ever voluntarily subject myself to are those “You bet your sweet As…percreme!” ones they play during Dr. Phil and the Kia commercial with dancing hamsters. Because: duh, dancing hamsters. But there’s another reason to be all gung-ho about the Super Bowl. One that doesn’t involve football or commercials. FOOD! Glorious snack foods. This I can do. So I made some Jalapeño Cheddar Crackers. And they’re pretty darn good–not just for Super Bowl snacking, but anytime snacking. They’re cheesy, crunchy, and a little bit spicy. Did I mention that they’re easy too? Because they are! Are you looking for other Super Bowl snack ideas? The Spicy RD has a round-up of healthy Super Bowl Sunday recipes and Julie from The Little Kitchen compiled a massive list of her picks for the 100 best Super Bowl recipes. 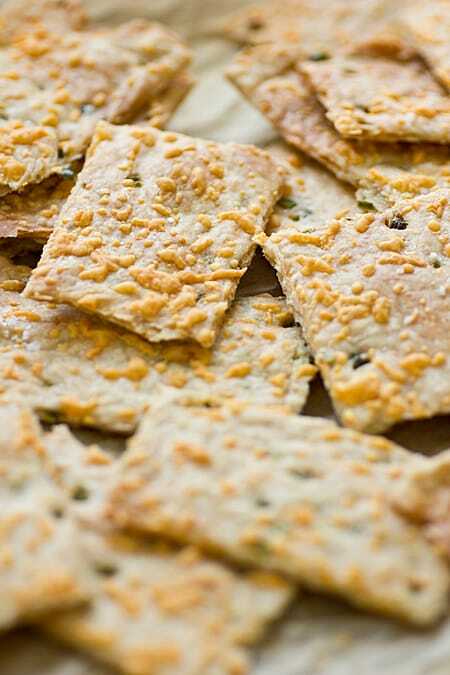 These crispy, cheesy jalapeño crackers are a definite crowd-pleaser. And they’re so easy to make too! Whisk together flours and salt in a medium bowl. Set aside 2 tablespoons of cheese. Stir in olive oil, water, remaining cheese, and jalapeño. Mix until just combined, careful not to overwork the dough. If needed, add another tablespoon of water to moisten. Line a large baking sheet with parchment paper. I used a rimmed sheet, but an unrimmed sheet would work too. 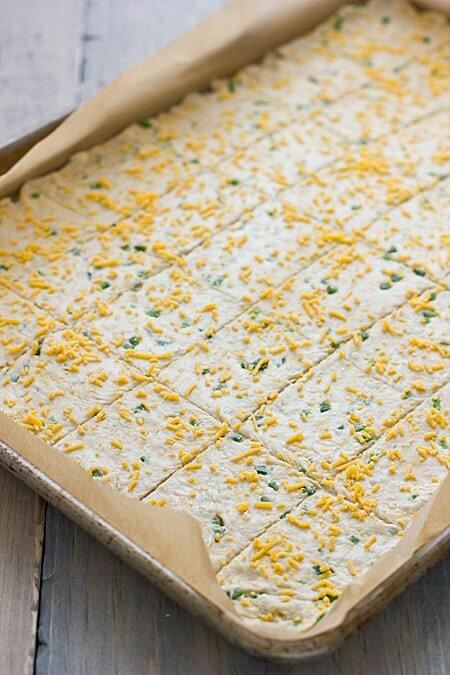 Transfer cracker dough to baking sheet and roll out it out as thin as you can–about the thickness of a saltine. Use a knife or pizza cutter to mark dough into rectangles. (Don’t cut the dough all the way through, just draw lines on it.) Sprinkle tops of crackers with reserved cheese and sea salt. Bake for 20-30 minutes or until crisp and just beginning to brown. Baking time depends on the thickness of the crackers, so be sure to keep an eye on them! Allow to cool completely, then break along lines. Store crackers in an airtight container; if they get stale, bake at 225 degrees for 10 minutes or until crisp. For spicier crackers, add a second jalapeño or use a hotter pepper. I’ve had a plan to make crackers for a while… but it never seems to happen. Thanks for the inspiration!!!! Making my own crackers? How fun! Even though I understand football, and I even played powder puff football in college, I still forget to pay attention. The only time I paid attention was when my husbands team (the Seahawks) went to the super bowl. Other than that, it’s all about the food…and wondering if Betty White is going to do another commercial. I grew up watching football and enjoyed it on occasion, but usually I can think of about a gazillion other things to do other than watch a game. I do admit I enjoy the Super Bowl commercials. And dancing hamsters are *mesmerizing*. Why is that?! They are so mesmerizing! That commercial totally brings me to a happy place. I haven’t seen it in a while, but I used to have to stop whatever I was doing to watch it. Man, I should not be admitting this, huh? Your football rendition is hilarious! I’m not a huge fan either (i just show up to eat!). Never got why a bunch of guys just run around, fall down in a pile, get up and do it all over again. However, there is the puppy super bowl…that is entertaining! your description of you playing football totally had me laughing. But soccer? Really? I find that the most confusing sport on the planet. And pretty soon I’m going to be forced to spend my Saturdays at soccer matches with the kids. Ugh. There will definitely be yummy snacks involved! I am totally behind you on the football! Just not a sports person at all. It was mildly interesting last year when it was New York vs. Boston, because should my loyalties go to my native city or my current one? But I found myself wanting to do the dishes instead of watching the game. Yikes. These look so good! I’m still putting together my Superbowl menu and these will be perfect. I’m totally not into football (I LOVE Nascar instead, just wait till Daytona and I have the biggest party) but it’s fun to watch everyone else react who IS a fan…and to eat. And maybe have a beverage. Thanks for sharing this recipe! I hope you like them if you make them! 🙂 I’m with you, eating is the best part of the Super Bowl. I always say I’m going to make crackers and then I never do. These may have enticed me. I don’t have jalapenos right now but I’ve hot chipotle peppers, I bet those would be good too. You SO need to make crackers. No one ever believes me when I say this, but it’s incredibly easy to whip up a batch and they taste so much better than store-bought. The base recipe is stuff you most likely have on hand and you can add just about anything to it–any herbs, any kind of cheese, any spice. So good! Don’t understand much about American football, but the snacks…that’s another story. I love them! Aw I can so relate to never wanting the ball playing sports in school .. I would promptly get rid of any type of ball, not just footballs! But I think all the rules and different ways of making plans are what make football so much more interesting than boring sports that are just passing an object back and fort! I usually do care more about the food than the game but this year with my team in it, I’ll be paying a lot more attention .. the food is still very important though, and these crackers look great! Yeah, I was the same way with other sports too, but football was my most dreaded. 🙂 I’m pretty much the most uncoordinated person on the planet–I’m lucky I can put one foot in front of the other and walk without falling on my face. I dont understand the football either but I just pretend i do and support whoever my friends are supporting and indulge too much 😛 oh well. these crackers look amazinginly good. will have to try it sometime because who doesnt want to snack on spicy crackers right? haha I understand you, I played flag football in college so I got better at understanding what was going on. Even if I enjoyed playing a lot I never watched a game. I just hate it. Its so long and I get bored…(I know this could sound wierd for a lot of people) I would just be amazed by your delicious looking crackers and not the game. Yes! The games are so long! I think my attention span is too short for that–especially when I have no clue what’s going on. When I first made crackers, I figured it would be a one-off thing, but they are so easy to make (and with ingredients I have on hand) that I find myself whipping up batches of them pretty often. They’re definitely worth the little bit of effort! I am SOO making these!! Love the cheddar and jalapeno combo. Oh yes….I see these crackers in my future. Bowing down in reverence… VERY cool idea! I bet they are amazing. 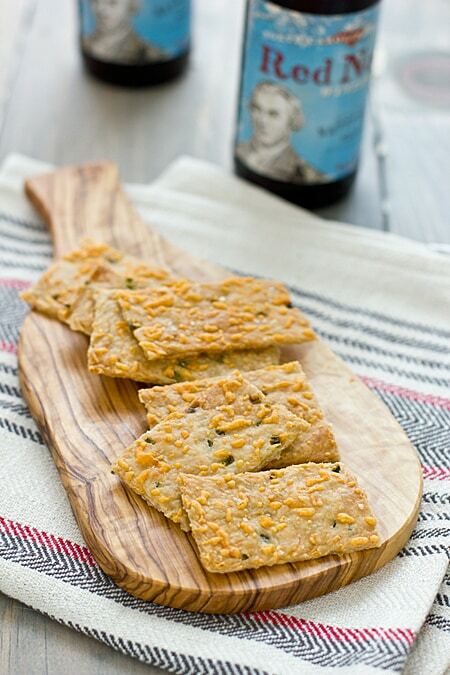 Wow – I’m impressed – I don’t make crackers, but my youngest son has been begging me to make gluten-free goldfish crackers. Wondering if I can convert this to a gluten-free recipe and cut them into little goldfish for him. I pinned this gluten-free version of Cheez-Its last week: http://www.beardandbonnet.com/2013/01/25/homemade-gluten-free-cheez-it-crackers/. I bet it would be perfect for making into goldfish! You’re like me, girl. I couldn’t care a fig about the actual game, but the food…oh the food! Lovely crackers!! !